Paintings and sculptures of beautiful female subjects are not anything new to your average art aficionado. Last Friday evening, many gathered at the “First Friday” opening at Artists’ House Gallery in downtown Philadelphia to see the Year of the Woman exhibit: art created and envisioned by women artists about women-only subjects. Julie Bell: “Scheherazade”, oil painting, 18″ x 15″. Julie Bell’s Scheherazade is one of the first paintings one encounters when entering the gallery. Though intimately scaled at under 20″, the painting holds true to the legend of its Persian protagonist as it grabs the viewer instantly and insists upon further introspection. Bell uses her magnificent prowess as a world-famous illustrator (her resumé includes corporate clients like Nike, Ford, Toyota, Sony Online) to seductively render her legendary female subject with reddish highlights on her hair, cheeks, and skin tones on her shoulders. Is it possible to envision a better modernized example of “the gaze” than this painting? Previously on artdoesmatter, I discussed the work of Philadelphia painter Katherine Fraser to make the association of a predominately male audience “gazing back” at the objectified female form in her artwork. However, Bell and the other women painters represented in this exhibit turn post-modern theory onward and past this notion, making one think, “What is this female contemplating here?” The famous story of Scheherazade in her most devious yet highly successful ploy to turn King Shahryar into her paramour and eventual queen is so aptly reflected in Bell’s rendering of her subject here; the facial expression and feeling of calm reflection is what one sees in this female subject – not just the obviously beautiful woman. Katherine Fraser: “Revelation”. Oil painting, 44″ x 58″. Gracing the walls of the second gallery area is the rather boldly-sized canvas of Katherine Fraser’s Revelation, an extremely haunting painting that portrays a decidedly-scared and lonely youngish female staring back out at the viewer. Fraser spent her childhood growing up in Maine; the backdrop of this piece may well be a Maine-wooded wintertime forest for a self-portrait-inspired reflection. 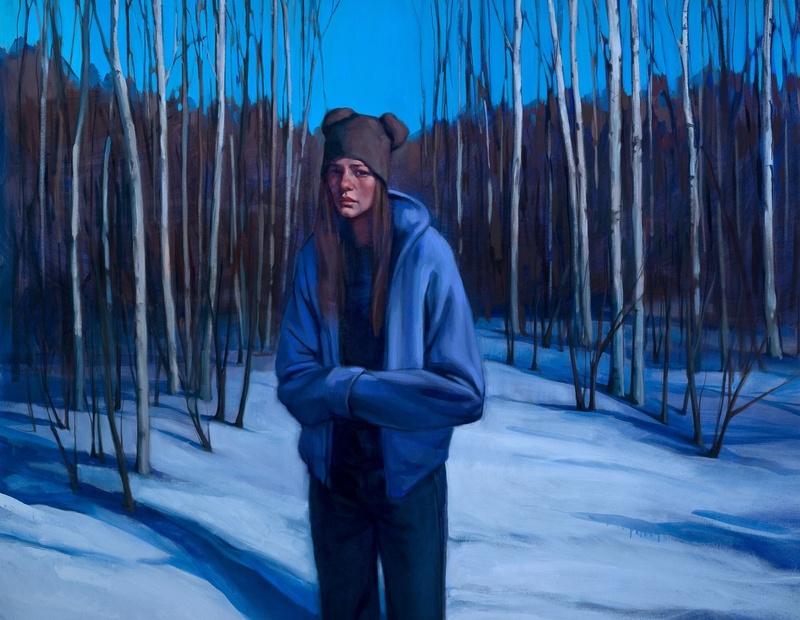 The darkened cobalt blue found in the sky, her sweatshirt and pants is reflected in the snow and adds to the haunting quality; her female subject is visibly fearful and nervous; the shape of her hat accentuates her youth and uncertainty. What brought her into these woods alone, and will this female subject find the solace she needs out there in order to return back to a presumably future daylight of hope? Fraser paints her subjects consistently with such a air of grace, in what could be referred to as a haunting introspection of self. There’s an alternate photographic aspect to this painting that “freeze-frames” this moment in time; the viewer may think he or she is seeing this female’s portrait through a camera lens with an added cyan or blue filter. This adds even more intrigue and a nighttime air of mystery to fascinate us further. Julie Bell and Katherine Fraser are two of twenty artists exhibiting this month at Artists’ House, April 3rd through April 28th, located at 57 N. 2nd Street in downtown Philadelphia, PA. Your well-worded description prompted me to visit the Artists’ House site to have a look at the other work. This is an interesting, intriguing and provocative collection, steering well clear of cliches and stereotypes and inviting deeper contemplation. How nice it would be to be able to view them at close hand – but then without the internet I would not have had even this distant pleasure! Pete – yet again, you’ve summed up exactly what I’m striving for here. Seeing these works in-person last week really stirred something up in me. Generally, I walk out of the gallery and know whose work I’ll be blogging; but this time, 20 artists, all creating such striking works – it’s challenging to chose which to discuss. But these two female painters really moved me. Thanks so very much for leaving such insightful feedback! I had a look at the Artists’ House website; it must have been difficult to pick only two artists… What a great show! Thank you for another great post, Patricia – quite enjoyable, very well articulated and illuminating! Dominique, thanks so much. It was nearly impossible to choose which works to discuss when 20 female artists of this caliber are exhibiting. When I entered the gallery, Julie Bell’s and Katherine Fraser’s subjects just immediately spoke to me of the female turning the whole concept of the gaze forward – women interpreting women. If I wasn’t so entrenched right now in my own metals’ artwork, I’d for sure be writing about this exhibit even more! The contrasts between the two images you have chosen are interesting Patricia. The warm colours and the knowing look (is it the eyelids or the near-smile?) of the Bell work are so different to the Fraser, certainly subject-wise. Looking further into their catalogued images, I find more warmth and mystery in Fraser’s work. Ironic because Scheherezade has mystery and warmth. Perhaps it is the painterly qualities I am responding to. Philippa – I’m very pleased you stopped by; it’s most insightful to see how another female painter such as yourself interprets these pieces. I do think the reason why you’ve responded more emphatically about Fraser’s work is due to her background and painterly influence she received while studying at Philadelphia’s infinitely famous Pennsylvania Academy of the Fine Arts (PAFA). The painterly realism and the obvious presence of a bolder brushstroke is a style of PAFA graduates. Having met so many of the Academy’s painters, I can see how that genre would elicit such a response in you. Thanks so much, Philippa, for your always-appreciated visits and thoughtful comments! I remember reading the Arabian Nights when I was quite young. The painting of Scheherazade is quite breathtaking and that is only on my PC. Her expression is fascinating. I love the whole concept of this exhibition. Women gazing back. I cannot agree w/you more: Julie Bell’s painterly vision of Scheherazade can’t possibly be given justice here as an on-screen pixel treatment. Bell’s heightened sensibilities as a detail-driven illustrator influence this conception of her female subject. Scheherazade’s facial expression is fascinating – and further makes one think of “what’s been going on” inside that wonderfully manipulative mind of hers – not just the outward physicality of her beauty. Sharon, thank you for giving my thoughts “a read” and commenting! Thank you for sharing such thoughtful and informative ideas w/us! It’s a great insight to have you comment on these pieces, as you are a very gifted oil painter yourself who works on the same large-scale canvases as K. Fraser. Doesn’t that backdrop of the Maine birch trees w/the stunning cyan/blues really add to this haunting quality of the female here? Anita, I know how swamped you are right now getting ready for your show – I can’t wait to hear all about it when May is here. Those gigantic abstract landscapes you’ve been creating of the woods/lake/sunrise/set are continuing to blow my mind. I need to get in-person to one of your Chicago open studios someday!! Hey, Patricia, thanks so much for your kind comments! I do love those birch trees and that blue. I think color is the first thing that “hits” you and sets the mood immediately before your brain even registers what the subject is. She definitely nailed it. And I forgot to say how effective the crossed arms in front are for the composition. That hat is quirky and reminds me of Mickey Mouse ears — a beguiling touch. I’m trying to do a bit of self-promotion (post cards) for my open studio. It is time consuming. And with all the rain, the roof over my studio leaks! Moving buckets and artwork and trying to stay ahead of the next leak! Oh yikes – hang in there, Anita! We’ve all had our share of weather-related studio issues, me included. Many ceramic artists I know have had insane studio and kiln disruptions from this past winter. I feel for you, as I know time is valuable just before a show. Just keep those stunning paintings of yours wrapped or moved around carefully! Thank you for another thoughtful post, Patricia. Although I’ve heard of Arabian Nights, I was unfamiliar with the protagonist until I read your post. By painting Scheherazade, Bell is participating in a sort of reverse ekphrasis. Interesting! Fraser’s painting is stunning, as well. She really seemed to capture the essence of the “blue hour,” that ethereal moment between daytime and night. Thank you so much for stopping by and leaving such a wonderfully articulate commentary. I will agree that both artists, either through the time-of-day setting like K. Fraser uses, or by manipulating through her portrait of a legendary heroine like J. Bell does, both artists leave a highly-impressionable “dent” in our minds after we’ve experienced these paintings (via pixels or in actual life). Love your feedback, Gina Marie; your visits are always welcomed!